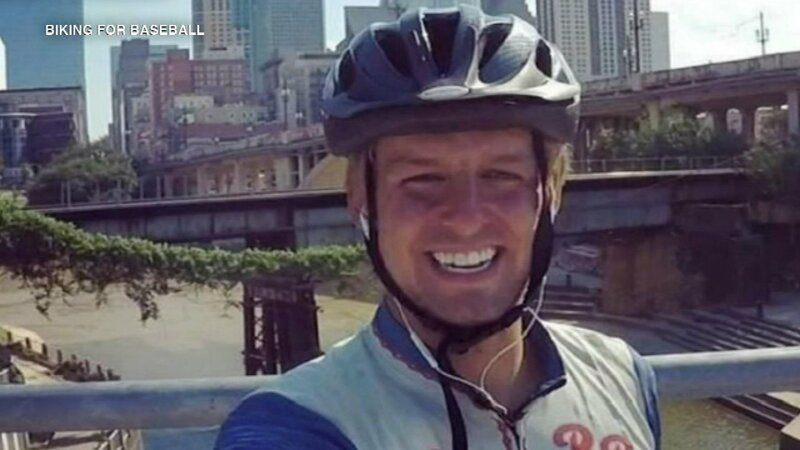 BIRMINGHAM, Ala. (WLS) -- An Orland Park man who was hit by a pickup truck as he biked cross-country for charity is opening up about the horrific experience. Tim Lalla was hit on a road in Alabama Thursday. He suffered several major fractures and lost a number of teeth. Tim was in the middle of bicycling to all 30 major league baseball ballparks for the organization "Biking for Baseball." His goal was to raise $160,000 to help put children in need through college. Tim spoke with ABC7 from his hospital bed in Birmingham about the dangers drivers present. "It's super scary, it's been scary for me since day one and now having it actually happen to me, I will always have that fear amplified tenfold, so overcoming a fear like that to get back on the saddle and complete a trip like this is going to be darn near impossible," Lalla said. Tim still wants to complete his mission. Two students will get the scholarship money he helped raise in a ceremony at Wrigley Field at the end of September.